Wild birds will thank you for this treat...bird seed cup cakes are easy,quick and very good for your tiny feathered visitors! Place case into a silicone cup cake case. This will help keep it shape will it solidifies and while you make up the seed cake. Thread the twine loops onto a chopstick or skewer and place onto a couple of glasses. This will help keep the twine out of the mix and held into place. Place a third of the seed mix into the paper cases. Maje sure you are using a suitable wild bird mix which feeds the type of birds that visit your garden. Melt enough fat - vegetable based or lard- into a heat proof bowl in the microwave until liquid. Beat in a tea spoon of brandy, whiskey or rum. Do not add too much spirit as this is only to provide extra heat to the little fellows...we really don't want them getting drunk!Spoon in enough to cover the seeds. Add more seeds to fill up the paper case and spoon on the remaining fat to cover completely. Once it's completely set and ready to go onto the branches peel off the paper case. You might need to snip the twine to tie it onto the tree. Now watch happy little birds get through a very cold winter. Brrrrrrrrrrrrrr!!! Thank you to everyone that made it to Harrogate and for making us feel so welcome! We had an fantastic time in this very pretty place. We managed to make it to Betty's and it didn't disapoint. Though Gok was in the building we didn't see him. Too many security guards and way too many people trying to get into the set. I hope to visit again but in warmer times as slogging up a steep icy hill with a wheelie suitcase in tow is not the best way to see this gorgeous spa town! Goodness, my feet have only just touched the ground again after Dublin and now me and my spotty shoes are heading North! The Craft Guerrilla girls are packing our craft cases for the final Knitting and Stitching Show this year. 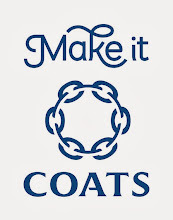 We will be in Harrogate from Thursday 25th - Sunday 28th November demonstrating upcycling and customising clothes in the swishing salon and teaching various workshops (and plenty of Gok gawping if I know Debbie and Louise). It is my pleasure to give you a sneaky peak of the designers that we will be showcasing at the exhibition. I'm pretty sure that you can sort out all your Christmas shopping just by visiting these wonderfully talented ladies, leaving you plenty of time to indulge in mince pies and mulled wine for the rest of the festive season! I have always enjoyed making things. all sorts of things. I have always sewn and over the last couple of years my work has developed into small pieces using hand stitching. I use fragments of recycled cloth, pieced together and embroidered over with words and phases. Words and phrases that I want to absorb into me. Recently I have been exploring how I might use my work and so I have started to exhibit these panels with a local art group and with a small solo exhibition. I have also been collaborating with a local Mother and Baby group to explore the language of childcare. 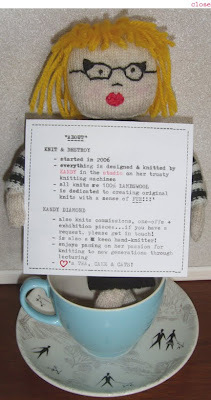 Kandy Diamond from Knit and Destroy makes machine knitted items with a sense of fun. When pushed by Craft Guerrilla for further for information, well, why type it when you can have a little stitched self in a vintage tea cup hold up a typewritten postcard all about you? Genius! paper, bags, baby clothes and cards. I am also learning traditional crafts like letterpress and book binding at a local workshop. I am truly passionate about what I do and love creating my quirky, naive and yet beautiful designs that people of all ages can appreciate. Rowan was born in June 1982, to possibly the least creative two parents in the UK. Both worked full time jobs, so on holidays and mornings before school, Rowan went to Grandma’s. Grandma didn’t like the TV to get hot, so after Saved By The Bell, it was switched off, and the paints, pencils, knitting needles, pins, wool and felt came out. Grandma spent a lot of time showing Rowan how to draw, knit, sew and the like, and it’s all Rowan ever wanted to do with her time from then on (plus catching Pugwall whenever possible!). KitschenSink Jewellery and Accessories are the result of quality time with Grandma, a fascination of colourful branded toys, and a desire to repurpose mass-produced materials into handmade, wearable fashion treats. I want to make people smile, to look at my work and feel a connection with the piece, be it a picture, a doll, or a brooch. 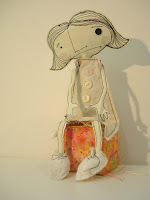 My creations are playful and fun, I use a variety of new and vintage fabrics, to create beautiful tactile craft pieces. I don’t like to over plan my work, and prefer to start with a simple sketch, and let it evolve naturally, enjoying the flow of extemporizing, letting the fabric determine the outcome. I love the imperfection of working this way, leaving edges raw, and threads loose, emphasizing the hand made care and fragility of the work. Now that I've tantilised your craft-taste-buds I'd better get myself to bed as I've got a train to catch in the morning. Hope to see you there! I love this ladie's jewellery. I first came across her work a couple of years ago quite by chance. Her work is amazing. Part sculpture,part fantastical almost dream like and with a touch of iconography... and the good news is that she's running a workshop! Using a miscellany of once treasured but now discarded objects; trinkets, vintage jewellery and ephemera, artist and self confessed hoarder Lili Spain leads a discussion and workshop which will breathe new life into forgotten things. Each participant will create and take home a unique and wearable sculpture. Participants are invited to bring along a piece of jewellery, a trinket or a locket sized photograph to use as a starting point, then they will weave and sculpt a new narrative around it using items from Lili’s collection of treasure. No prior jewellery making experience is required, just a little imagination and the ability to use a pair of pliers. This workshop is part of a wide range of exciting events we have planned at the Freud Museum to coincide with the Objects in Mind exhibition which runs from 24 November 2010 - 27 February 2011. £35.00/£30.00 Concessions or Friends of the museum. I can't believe that I am becoming quite hysterical at the thought of possibly meeting GOK WAN! OK,maybe I won't meet him but he'll be there and so will we! His loveliness will be at The Harrogate Knitting & Stitching Show on Friday with Rock Chick come fashionista Brix Smith (another legend! I loved her in the Fall). Apparently they're doing a full on Fashion Fix catwalk show on Friday the 26th from 5pm. We'll be helping out with the swishing area so fingers crossed...he'll come by to say Hi!!! It's come to my attention that how ever much we try it's not easy finding your own voice especially when the platform is so huge. The Internet is a great tool and we've met friends, made a fair share of contacts and made our mark! BUT it's not easy protecting your creations, your intellectual properties, your image and now your language. When I say language I'm referring to tone...IE how your blog,your web site and even your press release reads. Writing a good,easy to read press release isn't difficult. Lots of people just end up giving too much information therefore loosing the readers attention. Short,quick,blast of key information are essential. Launching your brand: find your costumer. You might be offering a niche product but there's someone out there ready for it. Brand your self accordingly and coherently. Plus consistency is also good and find your voice and language you want to use and that your followers/customers can relate to and understand. Decide what message you want your creations or events to convey and make it happen. Stick to it and believe in it! That's the first bit of advice and it's on the house. For example we get a lot of people from other craft groups/event organisers, which will remain nameless for now, that come to our blog copy and paste word for word and even name their events quite similarly to our own in a feeble attempt to associate their events with ours. All it does is create confusion and unpleasantness. I hope that if you're reading this that you'll understand and respect what we're saying. Don't do it again or you wont remain anonymous.So what is it that you want to offer your customers? A copy of something else? It's easy to get lost and look at others work but looking for inspiration doesn't mean you can carbon copy it. Initially I felt like it was a compliment,that others loved so much what I was writing that they couldn't find their own words to match my message. That's naive. It's frustrating and it grinds you down. By doing this they're just being lazy. What I propose to these people is that they contact me and I'll write them a nifty little press release but I'll write it for them in their own language and appropriate to their project but...there's a catch...you'll have to pay me or be really nice and offer me a trade off. It's simple. But that's not what this is about but speaking of which ,and it all ties in nicely, is that if you do want to use our PR services visit our web site and get in touch. We can help you feel a bit more confident and help you on your own crafty adventure! Now let us get back to the important stuff! It's official...we're excited about Christmas!!! 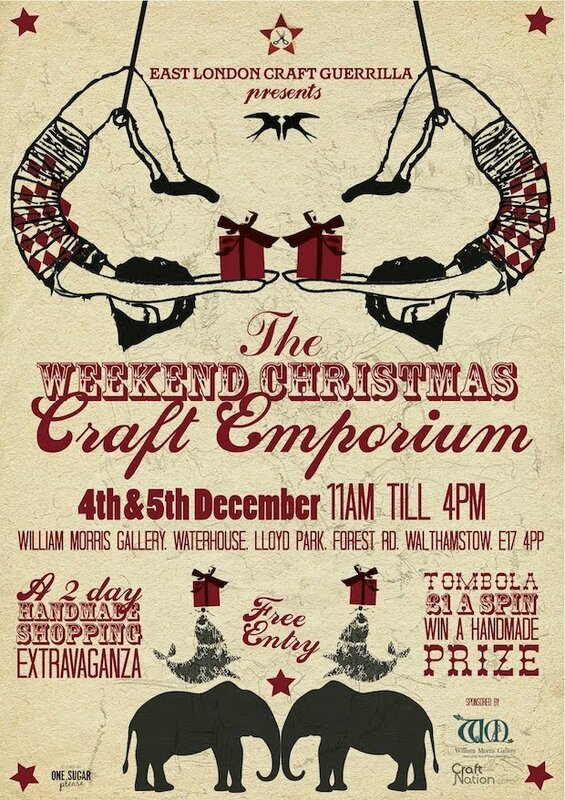 Well, about the Christmas Craft Emporium to be exact! It's only 16 days to go before the hand made gorgeousness begins! This year we have a whole bunch of new guys and gals as well as some of the faves from last year. From children's clothing & apparel,jewellery,illustration, prints,paper goods,soft furnishings to beautiful hand made leather bags and shoes. It seems quite apt having such quality craft in the home of the man that started it all...I think William Morris would be proud! 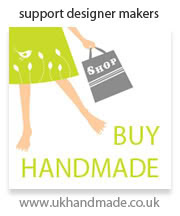 We occasionally get asked to feature people on our blog mainly to help advertise their craft business or projects. I absolutely love the zeitgeist for all things hand made which we're living through at the moment. People like Kirstie Allsopp might think they started a revolution but it's been quietly happening for quite a while now. Sorry Kirstie but you're about 5 years too late! If by bringing it to the mainstream it means people are more aware of CRAFT and gain a newer and more respectful understanding to it then...it's a good thing! 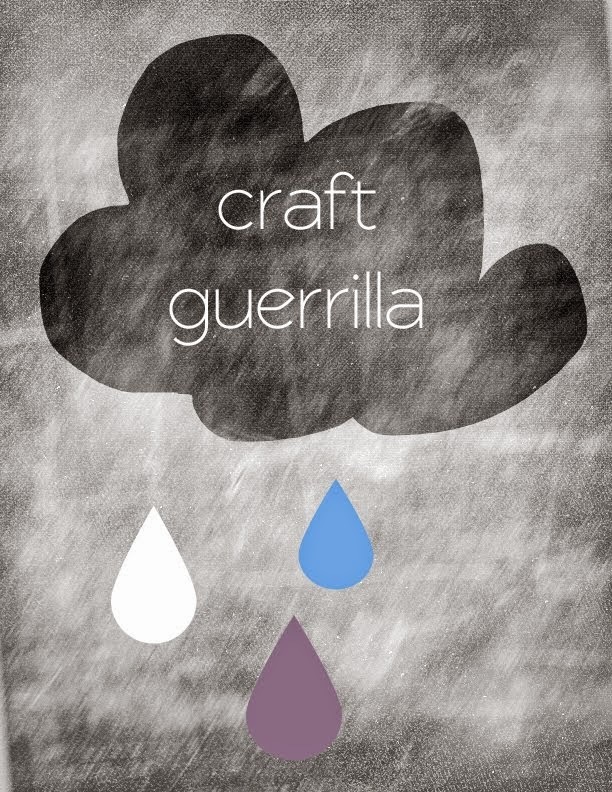 Craft Guerrilla is all about teaching,sharing techniques and spreading the D.I.Y. 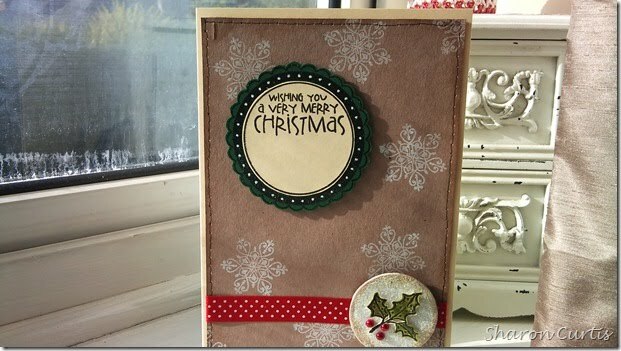 CRAFT message to all and by working with real crafters we hope to make that possible....so it's not difficult to introduce you to the lovely Sharon Curtis. 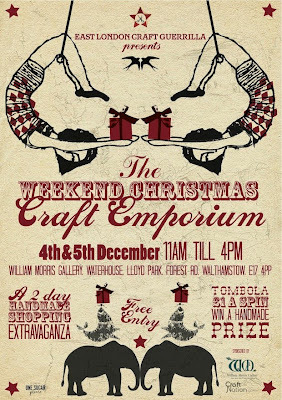 So if you fancy learning the art of card making get yourself to Crouch End and pop in to see her. 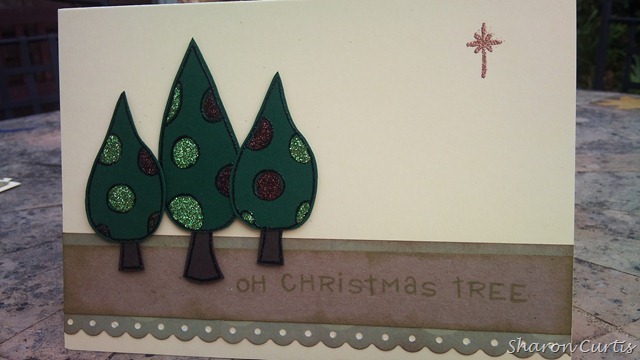 As we're so close to the festive season why not go and make your own Christmas cards? 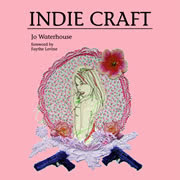 Last weekend at the TATE MODERN I spotted a lovely little book... Indie Craft by Jo Waterhouse. It took all my concentration and will power not to scream and jump around like an A.D.D. child but I did stand there and snap someone perusing through it though I did have to stop myself from saying..."we're in there you know!" I did restrain myself but what I felt was a sense of pride and sheer happiness to have in some shape or form my work in the TATE MODERN! As you know by now CRAFT GUERRILLA are showcased in this lovely publication. 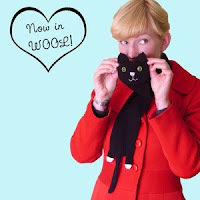 Myself (munano) and the gorgeous Peppermint Twist have been selected to appear among some fine designer makers like: Angela Chick, Knit the City, Kate Jenkins and lots of other talented crafters. I love this book...even if I am bias...but if we weren't in there I would still go out and buy it! Available to buy at the TATE MODERN shop, Amazon and all good book shops. When the Lovely Charlie asked me to review their magazine I didn't know what to expect exactly. I had seen Cross Stitcher Magazine on the supermarket shelf but it had never really attracted me before...well not enough to buy it. 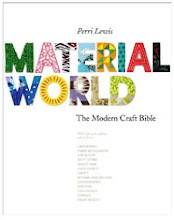 There is a sea of craft publications and I have to confess I am a sucker for a good cover and usually go by it when I choose one to purchase. I was told it had been "revamped" and that this was the new look Cross Stitcher. When the package hit my entrance floor I was on my way out and decided it would make perfect reading material on the Tube into town. Not only was it a great read but as it had a free project pack*(Gingham Tree decoration) it kept me busy on the way in! I truly was impressed and surprised! *note I always have a sewing set in my bag and a pair of embroidery scissors. These are not included in the free pack! The pages are filled with interesting and easy to follow projects with clear instructions. 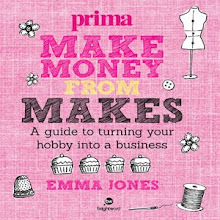 If you're a beginner you'll love this and if you're a dab hand you'll be as equally content as their are so many lovely things to make plus a great source of inspiration. This year I will not be making Chrimbo cards but decorations instead to gift family and friends. So what's it like? I love the look and the feel of it. It reminds me of French craft magazines which I always buy when I go over. There's an elegance but also a vibrant and young element to it so it's not at all a "granny makes" magazine. It's grown up but fun and definitely a magazine I will buy again so you can say...The cover has done it's work! *Thank you to the lovely Rebecca Emery aka one sugar please for her beautiful illustrations!